Previously known as Changan in history, Xian (meaning West Peace in Chinese) is located in central Shaanxi , at a river valley along the Yellow River . The city of Xian (population 6 million) was the first Chinese city to open up its doors to the ancient world, not in 1980 under the Open Door policy, but in fact during the Tang dynasty (618-907) when Xian boomed as the first stop on the Silk Road. Over a period of more than 2000 years, Xian was the capital for eleven dynasties. Along with Rome and Constantinople , this city was a world leader in culture and trade and played a vital role in bridging the gap between east and west. The culture of Xian is inherited from the traditions of one of the worlds earliest civilizations. Among the many dynasties, Xian was capital to, Qin Dynasty, the first empire of China; Tang, the Summit of Chinas ancient history, have left the city with the most abundant heritages. 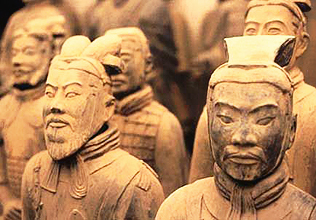 The Terracotta Warriors and Horses of the Qin period, an underground army of the first emperor defending his afterlife, is regarded as the eighth wonder of the world. Tang Dynasty has endowed Xian even more relics and spread its fame to the West via the Silk Road . The surviving evidence like Wild Goose Pagoda, Huaqing Hot Spring, Famen Buddhist Temple can all date back to that glorious era. the city wall, dating from the Ming dynasty (1368-1644), is still visible in places. It is the site of several educational institutions and numerous temples and pagodas. It has a large Muslim quarter which is the home to the beautiful 1,360 year old Great Mosque of Xian. The total area of Xian is 10,000sq.km. The population has just broken through 8 million; about 5 million people live in the city area. It is the largest and most developed city in the central to northwestern part of China and is ranked among the 10 largest cities in the nation. There is so much to see in and around Xian to keep even the most energetic visitor busy for a week or two. This makes Xian one of the most pleasant cities to get acquainted with Chinese culture and history - a destination for tens of thousands of foreign and Chinese tourists alike every year. The excavations kept going since then. The first pit was finished in 1974, which is built with earth and timber, measuring 210 meters long, 60 meters wide and 4.6 to 6.5 meters high, larger than a football field, containing more than 6,000 pottery figures. The life-sized warriors were dressed and appeared ready for battle with their spears and various other weapons. Each warrior with a height of 1.8 meters wears an army uniform, which distinguishes the soldiers ranks. Three rows of seventy warriors each make up the vanguard. They are followed the main body of the army, 38 rows of troops. 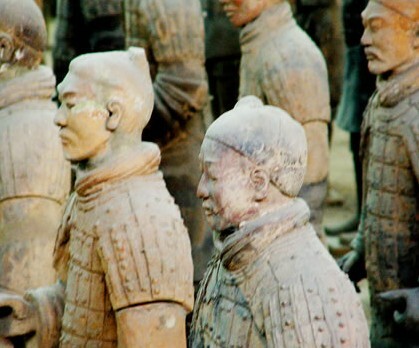 The terracotta figures of warriors and horses are well modeled and proportioned. The heads and hands were modeled separately and then attached. Each warrior has different features and facial expression. No two are the same. Uniformly strong and firm in appearance, they vary in individual aspects according to age, experience and social status. Some warriors have brows knitted and mouths set like veteran fighters with rich experience and wisdom. Others have eyebrows arched and show the fiery boldness and impetuosity of young warriors. They are also those with sternly fixed jaws and determined eyes. Curled moustaches and a cavalier air distinguish the others.Discovered in 1974, Xian Terra Cotta Warriors and Horses Site is one of the most important archaeological finds in the 20 th century. First chamber was discovered accidentally when 9 local farmers drilled a well for water. Pit 3 was discovered in 1980. Though small, the pit is thought to be the garrison headquarter of the Qin army. It has only one chariot, six warriors and a small amount of weapons. 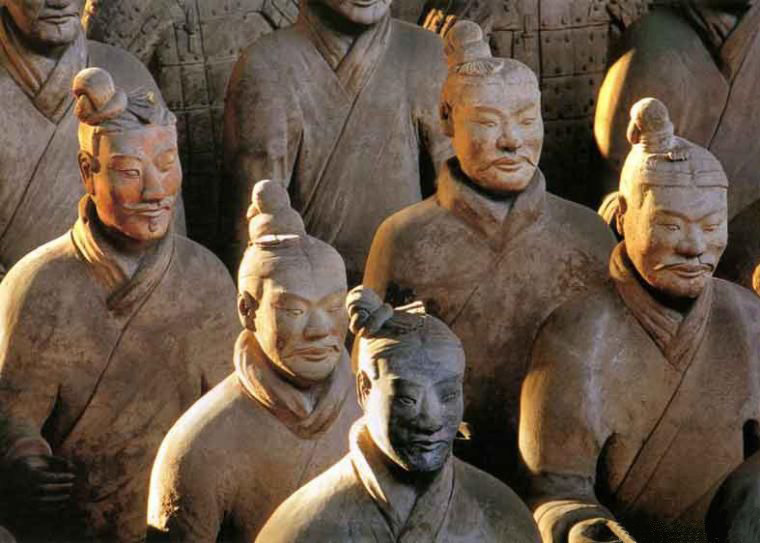 Chinese scientists have finally solved a lengthy riddle of where the 8,000 terracotta warriors were made that were unearthed in the 1970s from the tomb of Qin Shihuang, the first emperor who unified China. After 3-year joint research project, scientists reached the conclusion that the world-renowned terracotta warriors were created close to where they were excavated. The purpose of making these warriors and horses was to sustain and protect the spirit of their ruler for all the time. Built 600 years ago (1374 - 1378) in the Ming Dynasty, the Wall was added on the Tang Dynasty walls. 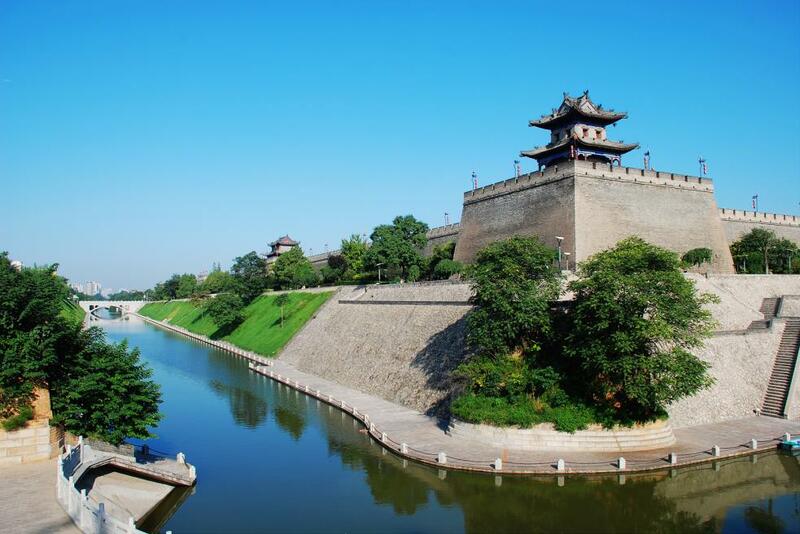 Being the most prominent walls built after medieval time, it is also the best-kept and biggest city walls in Xian. Since the location of Xian gives it strategic military importance, the Walls are very tall and were fortified. The eastern wall measures 2,590 meters, the western wall is 2,631.2 meters, the southern wall measures 3,441.6 meters, and the northern wall is 3,244 meters, totaling 11,906.8 meters. By the end of 2004 a total of 13.74 kilometer-long walls have been connected. The brick city wall forms a rectangle running 3.4 kilometers east-west and 2.6 kilometers north-south. Its circumference is 14 kilometers and it encompasses 11.5 square kilometer. The wall is 12 meters tall; it measures 15-18 meters in width at the base and 12-14 meters on top. On each side there is a city gate, over which the various towers majestically stand. There are four gates such as the East Gate (Everlasting Happiness), the West Gate (Eternal Stability), the North Gate (Pacifying the Outlying Areas) and the South Gate (Eternal Peace). The West Gate is the most impressive. The double gate system played an important role in repulsing enemy attacks. If the first gate were breached, the enemy would still find themselves outside the city wall and would be fired upon from the tower over the inner gate. Together the watchtowers, ramparts, and ninety-eight defense towers form an extremely tight system for military. 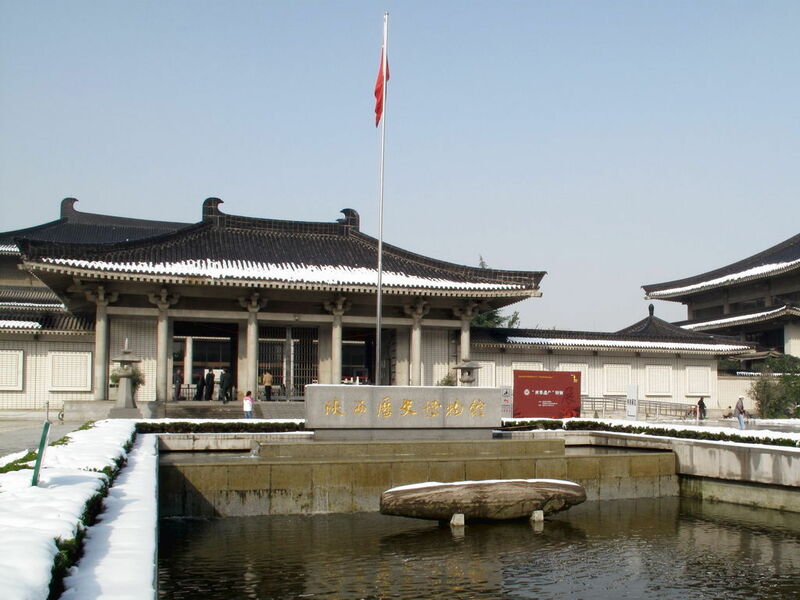 Shaanxi History Museum was built from 1983, and was finished on June 20th, 1991 and open to the public. The museum has an area of 65,000 square meters, building place 55,600 square meters, cultural relics storerooms of 8,000 square meters, exhibition halls of 11,000 square meters with a collection of 370000 pieces of relics. The museum is an architecture of Tang style, Hall in center, storied buildings in corners, elegant and dignified, magnificent scale, combination of traditional architecture and modern science, which completely embodied folk tradition, local feature, and epoch spirit. Situated inside Cien Temple (4 kilometers south of Xian City), it is one of the famous Buddhist pagodas in China. Sponsored by Tang Emperor Gaozong (628-683, reigned 650-683), the temple was first built in 652 during the Tang Dynasty as a symbol of thanksgiving to his mother for her kindness who had suffered an early death. The pagoda experienced many vicissitudes in the past centuries. 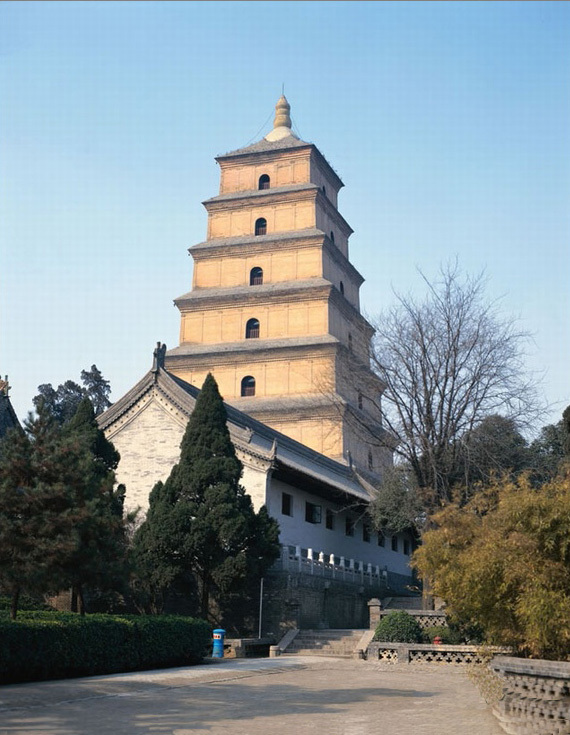 The present structure boasts five stories with 59.9 meters in height and the base of the pagoda is 4.2 meters totaling 64.1 meters in height. Legend tells that one day a group of big wild geese flew over, suddenly one of them dropped from the sky and died on the ground. Monks were at a loss and did not know what to do. They said that the dead wild goose was a Buddha. They buried the goose and a pagoda was erected, hence the name ? the Big Wild Goose Pagoda. 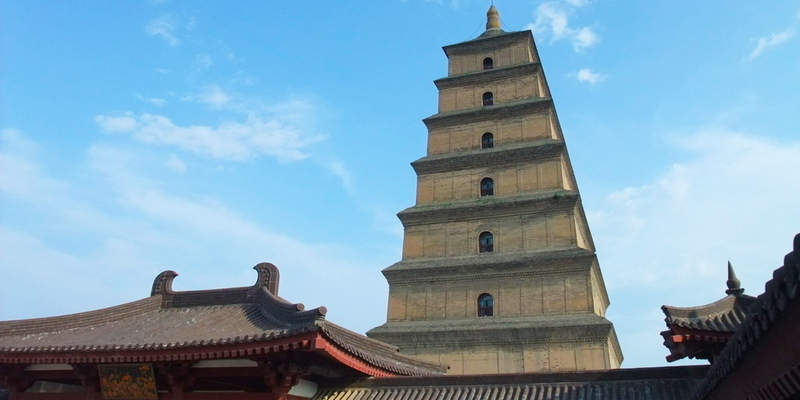 The Big Wild Goose Pagoda of Xian is a structure of imposing grandeur. 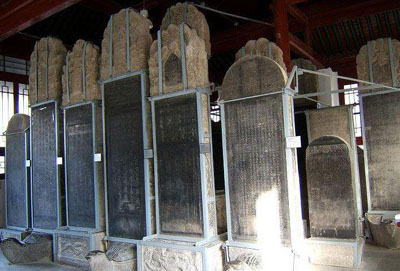 Established in 1090 during the Northern Song Dynasty, the Stele Forest in Xian is known worldwide for a fine collection of more than 1,000 inscribed stone monuments engraved during the period from the Han to the Qing dynasties for more than 2,000 years. The Stele Forest in Xian is not only a treasure house of ancient Chinese calligraphy, but also a rich collection of Chinas historical documents and records and stone carving patterns. These steles record a part of the great achievements of the Chinese culture and a testimony to the cultural exchanges between China and other parts of the world. 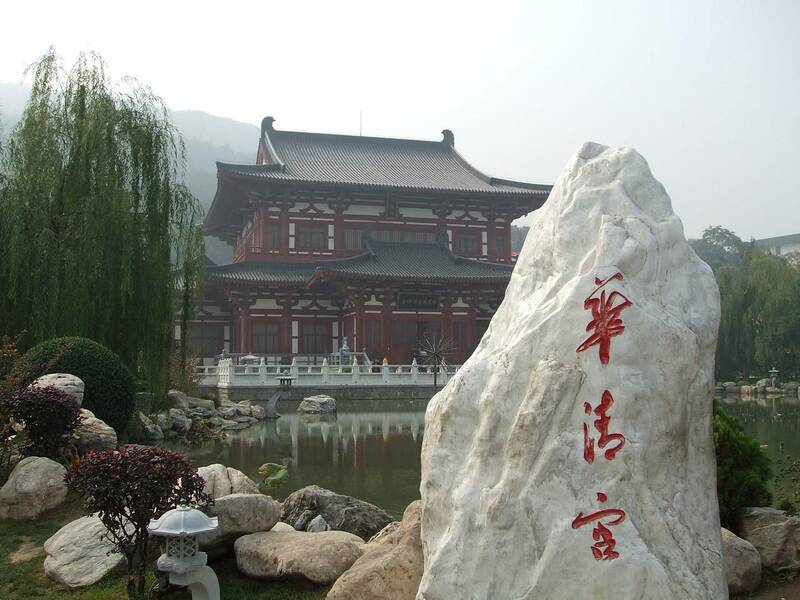 The museum, which used to be a holy temple of Confucius, is now a tranquil place in typical Chinese style. The stone tablets, which ages range from 4,000 years to the 20th century, were collected over the past 900 years from all over China. For archaeologists, steles are reliable storytellers. With nearly 10,000 pieces in the collection, the museum is like an encyclopedia of ancient China. Many people accredit the Forest of Steles as the Cradle of Calligraphy and Birthplace of Stele Engravings. 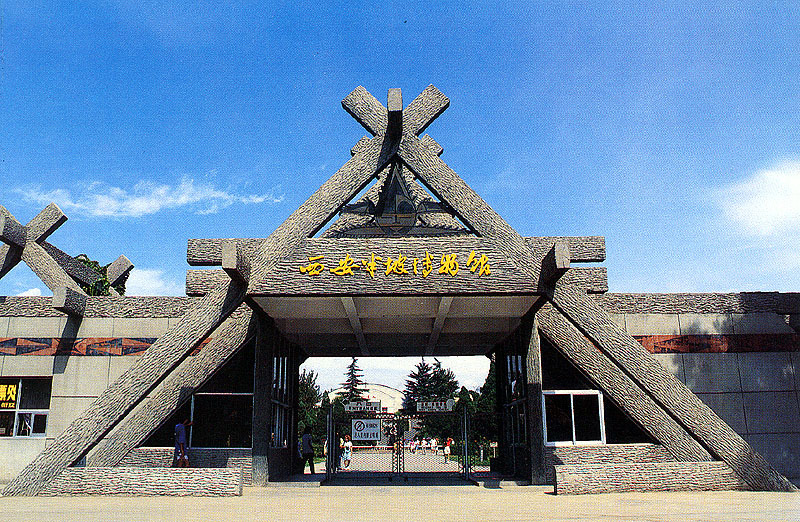 Huaqing Hot Spring is situated about 25 km away in the northeast of Xian. It used to be a former winter resort for emperors. Its natural beauty and many historical episodes connected with this spot are the attractions. Emperor You of Western Zhou Dynasty (8th BC) was the first developer of the place, and he built a palace here. Emperors of following 11 dynasties made it as their resort as well. The spot didnt gain national reputation until 747, when Emperor Xuan Zang (685-762, reigned 712-756) of the Tang Dynasty extended the palaces and built Huaqing Hot Pool for him and his concubine Yang Guifei, using water from the natural hot spring, hence the name Huaqing Hot Spring. The resort is located at the foot of the Mount Lishan. The springs were founded 3,000 years ago. They have a voluminous, regular flow and a constant temperature of around 43 degree Celsius (109.4 F). The water contains various minerals, which makes it suitable for medication and bathing as well. At present, Huaqing Hot Spring is a recreational center open to public, with all the old imperial halls and pavilions renovated. Over a hundred new bathing pools have been added to accommodate more people at a time. Located on the eastern outskirts of Xian, the Banpo Museum is the first on-location prehistoric relics museum in China. The five excavations lasted from 1953 to 1957. Visitors from home and abroad can see how villagers in a matriarchal clan community lived in the Yellow River reaches some 6,000 years ago. Encompassing some 50,000 square meters, the museum consists of dwelling areas, a pottery-making center, and a burial ground. The size of the habitation area is about 30, 000 square meters. One fifth of the whole village (about 10,000 square meter) has already been exhumed with a surrounding moat about 5 meters deep and 6 meters wide. The cemetery is located north of the moat. To the east is the pottery-making center. The distribution of the habitation area, the pottery-making center and the cemetery reflects the Banpo peoples idea of planning. Among the ruins are 46 dwellings, 2 domestic animal pens, more than 200 storage pits, six pottery kilns and 250 graves, including 73 burial jars for children. About 10, 000 artifacts have been exhumed, together with a large number of animal bones and fruit pits. The museum is composed of three exhibition halls for cultural relics, a main exhibition hall on the site and a temporary exhibition hall. Exhibits on display include tools and utensils. The museum was set up and opened to the public in 1958, renovated around 2005. During the prosperous Tang Dynasty (618 - 907) large number of Moslems traveled the world famous Silk Road to Changan (former Xian) bringing Islam to China. 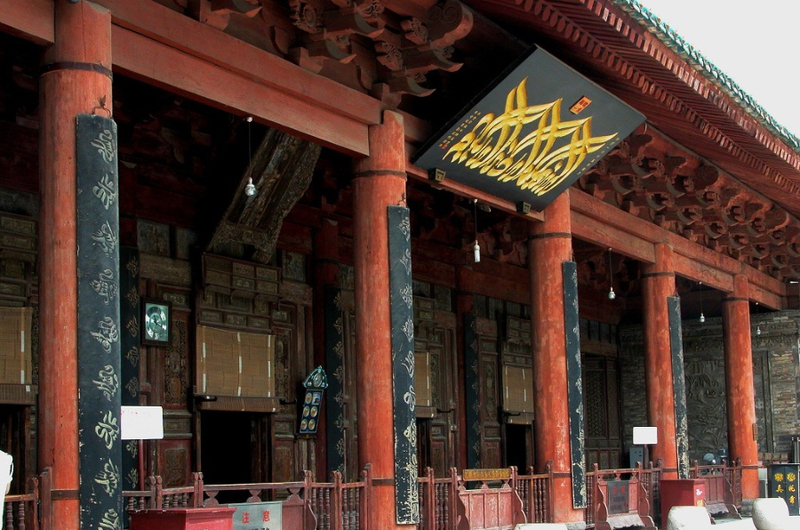 With the support of Tang Emperor Xuanzong (685-762, reigned 712-756), they established the Great Mosque in 742. It is well-preserved example of cultural merging, having been renovated several times and preserved by the Chinese Government. Traditionally decorated Chinese restaurants are a wonder to behold in Xian, and are a welcome break from modern yet sterile Chinese restaurants back home. Yangrou Paomo is a tasty xian specialty that consists of a mutton soup served with wheat flour flat bread. The hard bread is broken up and added to the soup. Then the mixture is eaten along with pickled garlic cloves. It makes for a hearty, filling meal that is not very expensive. This xian specialty can be found at several restaurants that have become famous for their delicious Yangrou paomo, as well as a small mom and pop restaurants throughout Xian. Xiguan Beef and Lamb Paomo Restaurant, Tong Sheng Xiang Beef and Lamb Paomo Restaurant, and Chunfasheng Paomo Restaurant are all good places to go for this tasty meal. Yet another interesting culinary experience in Xian is the Xian Dumpling banquet. This was first started in 1984 by the Xian Dumpling Feast Restaurant on Jiefang Road, offers up to 108 different kinds of Chinese dumplings ( Jiaozi ). Now the most popular restaurant for this is De Fa Chang Restaurant. Opposite Ginwa is Kai Yuan Shopping Mall, one of the biggest department stores in Xian. Both the price and the quality of the commodities and the sales service are often praised by shoppers, who have made it one of the most popular shopping places in Xian..
Supermarkets are numerous in Xian and are primarily distributed around universities and communities. However, there are some in the city center and the suburbs that are also easily accessible. The most famous include Vanguard, Ai Jia (IGA), Hao You Duo (Trust-Mart), Yi Chu Lian Hua (Lotus Supercenter), Ren Ren Le, etc.